When you run a business like a restaurant or a hotel, you need to have kitchen fittings and appliances that are durable, easy to maintain and long lasting. In addition to the counters and flooring tiles and wall tiles that have to be of very high quality, you have to also focus on ensuring that you get the best Commercial Range Hoods. This is one of the most essential features of any commercial kitchen exhaust. As a matter of fact, a number of residential customers are now getting this feature installed in their own kitchens. Commercial Range Hoods or commercial exhaust in Brisbane, also known as an “exhaust hood”, that you can get from A1 Custom Stainless & Kitchens have high grade features that are engineered to perfection. These fixtures effectively ventilate kitchen fumes, are convenient and help in keeping kitchen spaces free of fumes and smoke. Today, these are also available in a large number of stylish designs and finishes. It means that regardless of the styling of your exhaust commercial kitchen, you are sure to find a range hood to complement its look. Typically, Commercial Range Hoods in the Gold Coast are available in modern styling & a commercial stainless steel finish which adds a very aesthetically-appealing look to your restaurant kitchen. 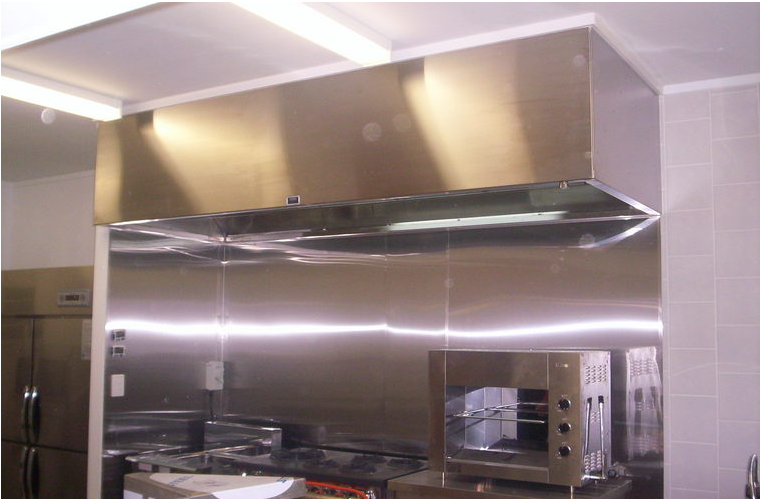 We have been providing establishments across Queensland with various types of commercial range hoods and have handled large and small-scale engineering & fabrication projects with the highest levels of expertise. Our expert and experienced crew of reliable tradespeople ensure that you get the best Kitchen Range Hoods installations on your commercial property. We have been operating in Brisbane for over 12 years, covering the whole of Queensland. We are familiar with both large and small engineering and fabrication projects. You will find all our products to be of the highest quality and very competitively priced. Regardless of how simple or complex your requirements are we will provide you solutions that are in-line with your specifications. How To Choose the Right Option– You will find a number of styles of kitchen exhaust available; in addition to the simple stainless steel ones, you will find some that have a glass encasement, which adds to the aesthetics. Based on the one you choose, some will be a little quieter than others and some will have lighting too. Style- The type of Commercial Range Hoods in Sunshine Coast that you use will be dependent on the layout of your kitchen. If it is fixed above an island style counter, its exhaust ducts will lead out through the ceiling; on the other hand, if these have been fitted above cooking ranges that stand against the wall, the exhaust ducts may lead through an exterior wall to the outside of the kitchen. We can provide styles including under-cabinet hoods, island hoods, downdraft hoods, wall-chimney hoods and ductless hoods. Airflow– Different models of exhaust hoods are able to handle different amounts of exhausted air. The greater the air-flow, the better the ventilation in your kitchen and all the steam, smoke and fumes will be removed from the space in a much more effective manner. Fan Speed– This is one more aspect you need to consider while choosing commercial kitchen exhaust or kitchen range hoods in Brisbane. You can find hoods that offer between 3-6 fan speeds. Some styles also tend to have automatic variation speeds. We recommend that you opt for a model that has at least 2 speeds. The low speed can be used when a meal is being wrapped up, while the high speed is to be used while cooking. We fabricate and install the Kitchen exhaust or Range Hoods in Brisbane based on your specific needs. We understand that no two kitchens are alike and that is why we provide customized solutions that take into account your kitchen’s requirements. While we provide high grade services, we always maintain a handle on costs and ensure that you get value on all fronts. When it comes to any type of commercial kitchen exhaust or Kitchen Range Hoods in the Gold Coast, we are the experts. For more information about our services and products, call A1 Custom Stainless & Kitchens at (07) 3888 7534. You can also contact us via this online form.